M any naval vessels at sea, and military detachments deployed around the globe, often lack organic weather radar information. Satellite sensors and receivers can provide near real-time weather information, but this information is often not continuously available. 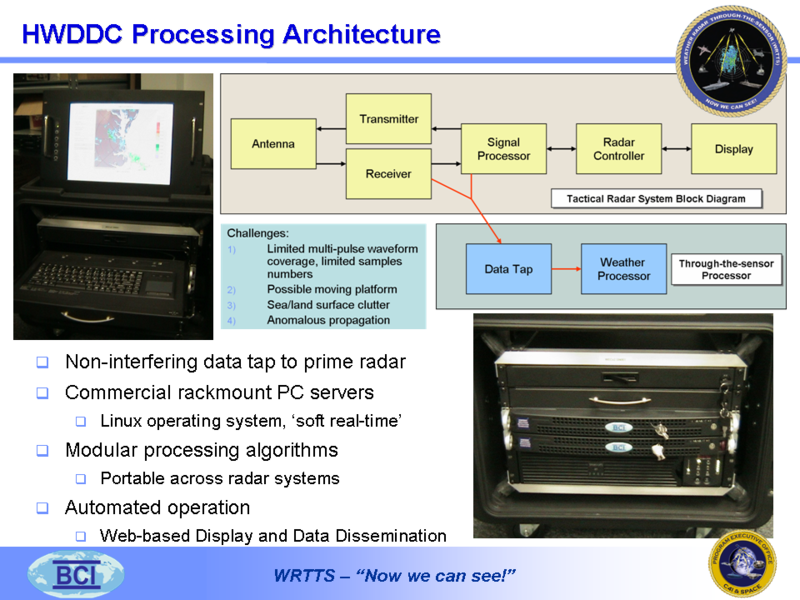 BCI, under contract to SPAWAR Systems Center, San Diego, has developed a real-time adjunct weather processor that converts tactical radar returns into meaningful weather radar information. The passive interface from the radar to the Weather Extractor Computer (WEC) means there is no impact on the tactical operation of the radar. The WEC is based on commercial, off the shelf PC server technology and adheres to the US Navy’s Open Architecture guidelines. Weather information updates are provided at intervals up to once per minute. Weather products are available from the WEC via standard Ethernet connection to an external network (such as IT-21, ISIS) or via closed-circuit video (such as 23-TV). The WEC has been developed and tested for the AN/SPS-48E radar. Additional radar platforms can be augmented with a WEC with minor software and radar interface hardware modifications.